We provide everything from consultation and production expertise to studio design and installation, from web streaming to location finding, from live transmissions to health and safety reports and technical surveys. Prime Television’s Technical support team have helped many productions, broadcasters and new media distribution companies around the world with technological advice that has help save money, increase quality or just made the media project run smoothly. Prime Television is currently consulting with broadcasters on the upcoming Royal Wedding as well as the 2012 Olympics. 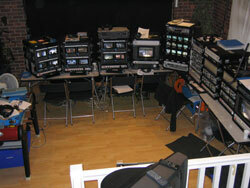 We are organising locations, production offices, HD Crew, live links and full studio builds. If Prime can be of assistance on these events please contact our project team at chris@primetv.com. Please call and talk to us about your next project or production and see what we can do to improve your plans, bring it in on budget or solve any issues you may have. Let us project manage your next project and see what we can do for you.